The White House Peace Vigil, started by simple living adherent Thomas in 1981. ^ a b c "Low Income/Simple Living as War Tax Resistance". NWTRCC. ^ Slocock, N. (May 2004). "'Living a Life of Simplicity?' A Response to Francis of Assisi by Adrian House". ^ Parry, Richard. "Ancient Ethical Theory". Stanford Encyclopedia of Philosophy. Retrieved 16 September 2012. ^ "Learning from the Bruderhof: An Intentional Christian Community". ChristLife. Retrieved 2017-05-23. ^ Marshall, Peter. Nature's Web: Rethinking Our Place on Earth. M.E. Sharpe, 1996 (pp. 235, 239–44). ^ Delany 1987, p. 10. ^ A Philosophy of Solitude, London, 1933. See also David Goodway, Anarchist Seeds Beneath the Snow (Liverpool, 2006), pp. 48–49, 174, for Goodway's comparison of Powys' ideas of the Simple Life to Carpenter's. ^ "Kavanagh's Lessons for Simple Living". Irish Times. November 23, 2009. ^ Osborne, Hilary (23 July 2009). "Daniel Suelo: Free spirit or freeloader?". The Guardian. UK. Retrieved 20 October 2011. ^ Salter, Jessica (18 August 2010). 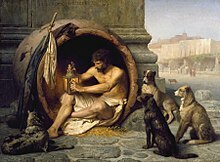 "The man who lives without money". The Telegraph. UK. ^ Robinson, Nancy (2 August 2012). "Retiring At Age 50 Is Realistic Using These Unorthodox Strategies". Forbes. US. Retrieved 20 August 2012. ^ Lisa McClaughlin (June 5, 2008). "How to Live with Just 100 Things". Time. ^ "Less is more: Simple living in small spaces". BBC News. 28 December 2011. ^ Tom Hodgkinson (2006). How To Be Free. ISBN 9780241143216. ^ Nini, Jennifer. "So You Think You Can Farm?". Retrieved 1 September 2014. ^ Robert Hart (1996-09-01). 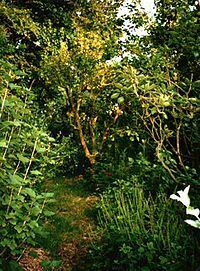 Forest gardening: Cultivating an edible landscape. p. 97. ISBN 9781603580502. ^ Robert Hart (1996). Forest Gardening. p. 45. ISBN 9781603580502. ^ Taylor, K. (August 8, 2007). "The Year I Saved The World." New York: The Sun." ^ Scott Nearing (2006). Civilization and Beyond. p. 101. ISBN 9781406834970. ^ Sale, K. (February 1997). "America's New Luddites." Le Monde diplomatique. ^ Zehner, Ozzie (2012). Green Illusions: The Dirty Secrets of Clean Energy and the Future of Environmentalism. University of Nebraska Press.